You are here: Home / Double KMC Report: 1st, Top 4! As you all know, I try to get a tournament report up after every weekend that I attend a Kaijudo Master Challenge. Well, I was able to attend not only one, but two KMCs on the weekend of the 22nd and 23rd! My apologies for getting this report of the weekend up so late; I was waiting to have all the matches and profiles up on YouTube so I could link to them. The plan was as follows: our teammate Spencer Swan would come down from Washington D.C., where he goes to school, on Friday, and he, Carl Miciotto, Gordon "Gorby" Hunt, and I would all take the trip to Raleigh, NC on Saturday morning. It was only a little over two hours away, so right after the event, we'd be able to get on the road for another three or so hours to head to Roanoke, VA, where there was a KMC the next day! Gorby's family allowed us to borrow the Yukon, so all that was left to worry about was playtesting and actually figuring out what to run... so, nothing too incredibly important. In reality, there was an air of cluelessness in our group for a while. The pressure was off for me somewhat, since I had racked up a second win in New Holland, PA two weeks prior. However, I still wanted to do well for pride's sake, and of course for the ability to help my teammates get their invitations and paid flights to Seattle. I had tested a little with Matt Segura and Gorby, and Segura helped me build a sweet LWF tempo deck with a dragon engine that was doing fairly well against everything we pit it against, even the LWD tempo that I used in PA. I still very much liked the LWD deck, though the build I tested wasn't too different from the PA build, but LWF was very intriguing. Spencer, who wasn't able to get in any real in-person testing until late on the Friday night right before Raleigh, was in a slightly worse situation. Having played my identical deck in PA and doing poorly with it, he decided he was committed to running control, and our team is historically not a fan of the "pile" decks, though we've used them to some success in the past. Spencer's deck didn't come together until the early hours of Saturday morning, but it was a 46-card LWD control deck, the deck tech of which can be seen on my YouTube channel. Gorby, meanwhile, decided to build WDF Dragons after testing a few other things because he had run it before and was comfortable with the deck. I got in no testing games with the LWF tempo on Friday night, but was comfortable enough with it and the theory behind it that I was committed to playing it. Carl had been debating running LWD tempo, but in the end, decided to hop on the LWF train with me. I think he wound up losing a couple games to Megabugs, which is still one of the hardest matchups for that deck, and decided LWF was a more solid meta call. I personally anticipated a lot of aggro and tempo variants, namely LWD and Megabugs, and I knew I had the advantage. I expected the only control decks there to be large, and felt that with my aggressive core, I could hopefully just win before they got to dropping big threats. I knew if they got to [ccProd]Eternal Haven[/ccProd], things would get very rough with only one Stormspark Blast and no Cassiopeia Starborn, but it was a risk I was willing to take. The one change between Carl's deck and mine was that he opted to use a second [ccProd]Stormspark Blast[/ccProd] over one [ccProd]Metal Max[/ccProd]. The level two creatures seemed very crucial to me, and their necessity was why I chose to run even one Lux, but in hindsight I definitely would have taken out one [ccProd]Psychic Predator Rusalka[/ccProd] for a second Stormspark. The deck itself was great, but running only four Shield Blasts has its downsides. In round one, I was paired up against Brandon Wheeler running a LFN [ccProd]Eternal Haven[/ccProd] ramp deck. I felt pretty comfortable with the matchup, but at the same time I knew I was on a clock. Game one went in my favor, but game two was when I initially realized I probably should have been running another Stormspark. Predator followed an early attacker for me and I was able to get some early swings in at shields, but Andromeda and Haven came out way too early for me to deal with and they easily clinched game two for him. From what I recall, I was able to make up for it by opening very well game three with a combination of multiple [ccProd]Nix[/ccProd] and [ccProd]Keeper of Laws[/ccProd]. During the final turn of the match, he opts for summoning Andromeda over playing Eternal Haven and killing something with [ccProd]Major Ao[/ccProd], so I was able to play Finbarr, break his last two shields, and attack for game. From what I recall, the situation was such that the Haven play wouldn't have been enough to keep him alive for a turn either way; my hand was thankfully just too big and I had too many options, allowing me to take the match 2-1. In round two I had a much better matchup, as I was paired up against Randy Chen with LWD tempo. It seemed pretty similar to the deck I ran in PA, so I wasn't about to be surprised if he dropped [ccProd]Vicious Squillace Scourge[/ccProd]. While Vicious would have been a problem card, I did have the Psychic Predators to stave off large evolutions if it became necessary. Fortunately, the matchup just played into my deck's strengths and I was able to take a 2-0 victory. I was paired up against Aaron Thomas' LDN Eternal Haven deck in round three, and while I don't remember specifics from this match, I know it went a lot smoother than round one, though I wasn't necessarily excited to be playing against another Haven deck. Apparently, my deck was able to do its thing before Haven did its thing, because I took the match 2-0. At this point, I was feeling good at 3-0, and while Carl and Spencer took a draw in round one, they were still very much alive in the event at 2-0-1. Gorby had unfortunately taken his second loss by this time with WDF Dragons, so it didn't look like he'd be able to make the top eight cut, but it looked like I would potentially be able to double draw in while Carl and Spencer still had to gather another victory. 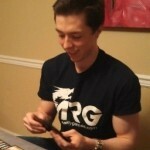 In round four I had to play against Team RNG's Rob Miller, who was running an incredibly large and incredibly scary LWFN ramp deck featuring the usual suspects and even two copies of Humonguru. We decided it was safe for us to take a draw and put ourselves at 3-0-1, which was fine with me because I definitely wasn't sure about the matchup. We played it out for fun, and both games went pretty similarly bad, as his ramp allowed things like Andromeda, Cassiopeia, and Haven to hit the board long before I even got close to winning. I was much happier that we'd taken the draw after that creaming! The way the tiebreakers worked out, two 3-1-1s would potentially not make the cut, so when I was paired up against Drew Bridges (also of Team RNG), I was a little concerned we'd have to play. An intentional draw would guarantee my top eight, but not his. We looked at the matches going on and the standings, and he decided the best bet was to draw with me and hope his tiebreakers didn't kill him in the last round. It worked out, and we both managed to snag top eight spots! Carl and Spencer also made the top cut, as did Josh Hackler, Brandon Wheeler, and RNG's Alex Japit and Rob Miller. The tiebreakers worked out pretty well for me, and I was paired up against Drew again in the top eight. We had played for fun after taking the draw, and I was able to use the advantageous matchup to take it 2-0. The top eight was more or less a repeat of how that match went, though game one was much closer. We were both topdecking creatures every turn, but were too scared to actually go in at shields. Eventually, I was able to get a Prime to put myself a little ahead, and as soon as I felt that I wasn't going to auto-lose to a Shield Blast, I went in for game. I don't think game two was as exciting, but I took that one as well. Spencer and Carl had both won their top eight matches and found themselves playing each other in top four. This meant that if I was able to beat the other top four competitor, Josh Hackler, one of my teammates would be guaranteed to win the paid trip since they'd be in the finals with me and I already won one. In addition, Spencer and Carl had both entered the top eight at a higher seed than Josh, so the invite would pass down to one of them at third place. This all also just gave me a great excuse to try to win my second KMC in a row after PA! Josh was running LWF Dragons with a playset of Dawnblaze Patrols to function as more of a tempo deck against control decks. I'll post the match below so you all can watch it to see specific plays, but in the end, I was able to take the win 2-0 to get my second top two performance of the season! Carl defeated Spencer in the other top four match (which I found a little surprising actually since I believed Spencer's LWD control to be the favorite against our deck), which meant it was a mirror match for the title. At this point, there was nothing on the line since prizes were handed out post-swiss and Carl was getting the paid flight win or lose, but with two KMC wins under each of our belts, we were both hungry for the title. After losing a crushing game one involving Carl drawing a giant dragon with Logos Scan to combo with Herald of Infernus to seal the game, I was able to take the next two consecutively and take the tournament! The match is down below, so be sure to check it out! Winning the tournament and becoming the first person to take two KMC wins in a season (on back to back weekends, even!) felt great. Of course, the major accomplishment of the day was getting Carl and Spencer qualified. There was, however, still much work to be done. Spencer and Carl had agreed to each go in half on a plane ticket for whoever lost their top four match and didn't get my passed down flight, so Spencer still needed to win a flight if possible. Gorby also still needed his invite. With those goals in mind, we began the trek to Roanoke, VA immediately after a delicious dinner at Chili's. Much of the car ride was spent strategizing, and we had some time for brewing, deck building, and playtesting in the hotel room before bed. Going into day two of the weekend, I was pretty sure I was going to run a Light/Nature Megabug list I had written up the day before the trip. I had given the list to Carl as well, and though we only got in a couple games of testing with it, it seemed solid. The idea was that by taking out the Water cards, we could have room for three Blinder Beetle Prime, an adequate amount of bugs and Enforcers, and do better overall against the aggro and tempo matchups, which we figured would be abundant. Spencer, meanwhile, was inspired by Rob Miller's ramp deck from Raleigh and decided to brew up his own version with a lot less cards, but a few neat tricks and progressions designed to be very good against the tempo decks. I tested a match against it using the LN Bugs and promptly got destroyed. I audibled right then and there and decided to sleeve up his deck a few cards different for the next day, but wound up audibling AGAIN the next morning. While in the shower, I got the urge to run LDN "Junk" Haven, a deck that I had wanted to run for some time but never really saw the right situation. I knew the deck had a pretty bad matchup to other, larger control decks if I wasn't able to see my discard and Keeper of Laws in the early game, but on the bright side, it had a theoretically insanely good match to anything aggressive. I jokingly bragged to my teammates that I wouldn't be losing to any deck that attacked- er.. rather, attacked before turn ten. It wound up totaling 41 cards after I added the one Lyra last minute. There are some awkward-looking numbers, such as the inclusion of only two [ccProd]Terror Pit[/ccProd]s, but a lot of it was because I was going to lean very hard on the Prime engine. I figured it would be enough to clear board on turn five most of the time, and with double Humonculon, I didn't really need all the Pits. Lyra was only really included for the power on a stable body in order to help answer opposing Lyras and Primes. 6000 is a pretty important benchmark. Running cards like [ccProd]Sword Horned[/ccProd] and Humonculon in a control deck was also one of the best feelings ever. I felt like I had an early game that matched that of any aggro or tempo deck, as well as a plan to ramp up to the most ridiculous Monarch as soon as I was ahead in cards thanks to my discard and removal. Barring completely terrible matchups, I was excited. Gorby decided to run the Dragon deck I used in Raleigh (with the change of a second Stormspark Blast over the third Predator), meaning all four of us on Team Peach were on different decks for the day. In round one, I played against a LWD tempo deck used by Karim Soliman. Having won with it earlier in the season, I obviously knew the deck is very powerful, but I was slightly less worried since I had such a good matchup. Unfortunately, I started the day off on a pretty bad series of plays as I made a few consecutive less-than optimal moves in the first six turns of the match. One such play was using Reap and Sow in the face of [ccProd]Cyber Scamp[/ccProd] while having no good line of play to deal with an army of guys that early. I was lucky enough to have both my [ccProd]Terror Pit[/ccProd]s in shields and basically stole game one after playing terribly, something I tried to make light of while shuffling for game two. Fortunately, things went smoother in that game, probably due to me not making bad plays, and I was able to take the match 2-0. Round two brought me a much worse matchup. The Canadian crew in attendance had brought a couple ramp decks with them, and I was up against Greg Cresswell of that group in round two. He was running the same civilizations as I was, but with a much larger card count and a focus on Skyforce Champions. I wouldn't normally be worried about those cards, but the sheer fact that his deck ran many more threats than mine meant I was in for an uphill battle. My hand also probably lent itself more to going second in game two, so I think it was a mistake to choose to be on the play after I lost game one. Eventually, he saw Eternal Haven, which I didn't see in time, and beat me 2-0 with some pretty decisive later turns in both games. In round three, I was again able to play in an advantageous matchup. Mai Soliman was my opponent, and I had seen her playing the mono-Fire rush deck earlier in the event. Though she came out swinging both games, the early game of my deck was just too much to handle, and after clearing her board, I was able to go into cards like Andromeda and Haven to seal the match 2-0. At 2-1 and only five rounds remaining, I really needed to win my next match. Spencer and Carl were already locked into the top eight after winning their first three, but I still had to fight it out on the bubble. After checking the pairing sheet and praying for a good matchup, I saw that I was paired up against none other than Ricky Gross! Usually I'd be a little put off by being paired up against one of the most skilled players in the room at such a critical time, but I was definitely a fan of the matchup since he was using the newly popular LDF [ccProd]Flamespine Ravager[/ccProd] aggro deck. Though I had been bragging that my deck didn't lose to decks that attack, I quickly found out in game one that I may have misspoke; my deck could definitely lose to aggro decks in certain scenarios, one of which being somehow having no play until turn four. It was pretty brutal and I just couldn't get anything going in time. Fortunately, bad luck couldn't get to me in two out of three games, and I was able to take the match overall to put me at a solid 3-1 record. Round five was relatively unexciting for me, since I simply took an intentional draw with Sean Castor, a player from my local, but Matt Segura was forced to play it out against the lone seven pointer currently in contention. He managed to take it in three, rounding out a top eight of Segura, myself, Carl, Spencer, Sean, Josh Hackler, Greg Cresswell, and Richard Yan. In the top eight, I was paired against Carl, running the LN Megabug deck. Spencer was also in our bracket against Sean Castor, so the hope was that either one of us could scoop to Spencer in top four if he was able to win. My match against Carl went pretty well since I was able to take advantage of the one glaring problem with not running water in Megabugs: no good answers to Andromeda. LWN Megabugs can max out on Finbarr, [ccProd]Rusalka, Aqua Chaser[/ccProd], and [ccProd]Piercing Judgment[/ccProd], while an Andromeda or two against the LN deck meant it was time for Carl to scoop up his cards. My hands allowed me to live for long enough and keep his board at bay, and I took the match 2-0! Spencer managed to defeat Sean, so he was essentially in the finals with my concession to him. However, that didn't mean we couldn't play a match! Though it had no bearing on the final results, I wanted to play it out to see if I could have conceivably made the finals of three consecutive KMCs, and Carl recorded the match. Spencer's LWFN ramp deck definitely had a few problem cards for me (namely Reverberate), but I was able to see discard consistently that really put him too far behind in both games. With that 2-0 victory, I was off to collect my prizes and watch as Spencer battled it out against Richard Yan's mono-Light rush deck in the finals. I was a little worried for him since he didn't have as great of a rush matchup as I did, but he managed to pull it out in three games to take the match and the flight! Yet another highly successful day for the team. Check out the finals below! Overall, it was a great couple of days. I love traveling to events and getting to do so well alongside my teammates was icing on the cake. We were able to take 2/2 flights, and two more invites, with Carl and Spencer now being qualified for the Summer Championship in Seattle, Washington this June. Segura and Hackler were able to snag the two invites in Roanoke since they passed down through a number of people, which is great news since they're both friends of the team. Unfortunately, Gorby still needs to qualify after a rather unfortunate showing in Roanoke, but hey, that just gives us an excuse to go to another KMC this season! I'm hoping scheduling works out to where we can hit ARG's very own KMC in Ohio later this month. Hopefully you were all able to stick with this gargantuan report until the end. If you've made it this far, I hope you enjoyed the ride! Make sure you leave a comment below with any thoughts on my report, the decks, or if you have your own KMC experiences to share, and remember, Play Hard or Go Home!